I've had this set for a while and never really used it-I've tried things but they haven't ever made it to a card. I pulled it out and here's what I did: stamped the daisies in versamark on light yellow paper, outlined them in black, and colored the centers in with a white gel pen. I wanted a really graphic, old style look. I was inspired by Sarah's use of the Cuttlebug on only a portion of her card found here, so I added the textured dots to juxtapose the lines in the stitched ribbon and dots. The sentiment was pulled used because the image of a field of flowers just brings calmness to me and I thought others would appreciate themselves. I finished the card with a little bit of crystals to further my modern look. Wow... another great card! I love what you did with that image... just gorgeous! absolutely gorgeous card!! so elegant, love it! Wow, that looks great! Love how you outlined and colored those flowers; makes such an impact! Super card (and makes me want to pull out that set, too -- haven't used it for quite awhile). Visually stunning card! What a fabulous idea to use white and outline in black. I used the same stamp in mine, but with completely different results. Wow Karen you never cease to turn out some amazing cards. Another gorgeous one! Oh I love this...such a gorgeous card! Wow... very striking!! Love the look of this card, the embossing really sets off the stamped images and ribbon! Love those flowers! The sentiment placement is perfect! Such a great simple WOW! Love it! What a great job with this challenge. Your card is just so beautiful. Congrats on your bloomer badge. 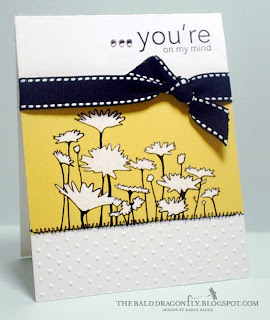 Your card rocks ... love how you completely changed the feel of that stamp with your cool graphic design. This is a really stunning card. I love the bold graphic feel it has. Congrats on being a bloomer! Very pretty. COngrats on top 5 bloomers! Love the outlining you did. Stunning card! Love the technique you came up with! Beautiful! love the way you used that set! amazing!! Wow, this card is amazing! Love the technique you used to make the flowers look so striking. I love that stamp set too, so I might need to try your way of using this. Glad to have found your blog today. Karen, this is just gorgeous! I love it! :) The colors are so fresh and fun! Congrats on getting on the top 5 - well deserved! Congratulations - totally deserving of being one of Lisa's top 5 - yeah!!! what a great idea! Such a simple way to make the flowers stand out!! I'll have to try it with my set! Beautiful, just beautiful! Love your blog, BTW! wow! definately a "knock your socks off" kind of card! amazing what you did with the black marker and white gel pen...genious! Great card! I'm glad you explained how you did it. I love all the details & the color combo. Nice! Yay! Congrats on being MOXIE FAB this morning!!! See what a little inspiration will get ya! ;-) Lol! Kidding... But Congrats, your card is awesome girl! Congrats!!!! This is lovely and worthy of a medal ;) Great colors and details. This is beautiful! One of my fav's! Congrats on the MOXIE win! Congrats on your place in the stamping Olympics - I just had to come here to your blog to find out how you did that. Thanks for the explanation on a really great look. Congratulations on both wins!! It is a beauty. FABulous card!!! CONGRATS on your Moxie Fab win!!! I'm looking through you "find me here" list and love some of these winning cards. Love the texture of this one.